Buying a home is likely the largest investment you will ever make. There is plenty of preparation before you start house-hunting, so make the process as smooth as possible with this guide to buying a home. - We can’t say it enough: mind your credit! Unless you have the funds to pay for a house in cash, then you need to keep an eye on your credit. Get a report from all three credit reporting agencies from the Annual Credit Report website. - Know what you can afford. Make a budget and stick to it, recording everything on paper or using budgeting software. Once you see where your money is going, it’s easier to cut some unnecessary things to put towards your down payment. - That said, start saving now, not only for your down payment, but any other expenses associated with a home purchase: inspections, closing costs, and taxes are a few to expect. - Once you are close to having all of your down payment, start shopping for the best mortgages, and get pre-approved. Being pre-qualified is great, but it’s not much help if you’re not approved for the loan. - Be ready to compromise on certain home aspects: square footage, having to make minor repairs, or even living on a busy street. If the price is right, the house fits your needs and wants, then put the it on your possibilities list. - Just because you’re approved for a certain home loan amount doesn’t mean you have to max that budget. You need as much leeway in your finances for emergencies and unexpected costs. - Prepare yourself for possible let-downs: some perfect-for-you homes are also perfect for others who are on the search for a new house. 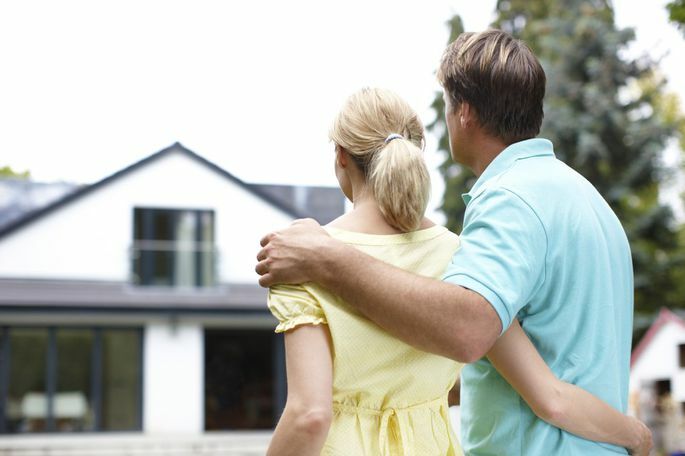 If there are several offers on a house, you may have to walk away from it and keep hunting. - Don’t go through it alone! Find a RealtorⓇ that you trust and like. These real estate professionals are your ultimate guide through the home-buying process, and will make it so much easier for you. The house-buying process for most Americans takes a bit longer than what we see on the home-buying television shows. It takes planning and patience to find what you need and want. So, do your “home” work, and you’ll soon be on your way to being homeowners! You love your new home--everything about it. Well, almost everything. Your bathroom decor is stuck in 1983 with its gingko leaf-etched shower doors, mauve and Colonial blue wallpaper complete with coordinating border, and ornamented brass fixtures. If a complete overhaul isn’t in your budget just yet, there are plenty of options that are easy on the wallet. Check out these tips for inspiration! - Paint over the wallpaper! Benjamin MooreⓇ suggests you start by sealing any peeling spots with adhesive, applying clear caulking around the room where the wallpaper meets the ceiling and floor, then priming the wallpaper with an oil-based primer. Using your choice of latex interior paint, paint as you would any other wall surface. - Switching out the dated sink fixtures is as simple as finding the correct pieces to go into the configuration for the existing fixture in a style you like. Once you’ve made your decision, confident do-it-yourselfers can switch them out themselves, and Home Depot shares this step-by-step video how-to for sink faucet installation. - Updating your light fixture can be a huge improvement, and the choices are almost endless at local home stores. Changing the location of the light, or adding wall sconces may require a call to a reputable electrician, so don’t forget to budget those extra costs. - Ugly linoleum can be covered with adhesive-backed vinyl tile or painted with porch paint, and if you’re feeling creative, you can have a custom look like this striped floor from 1915 House. Supplies may cost a bit more than other paint jobs, but it beats the expense of replacing the flooring. - Replacing the cabinet can be expensive between the new cabinet and labor, so the best way to improve it is to paint it and add new hardware. Countertops, depending on what material they are, can be painted or even tiled for a fresh look. - Add style to a plain mounted mirror with a frame! Framing kits come with everything you need for this quick update, and are available at home centers and online for less than $100. - If your budget is tight, just the purchase of a new shower curtain, window treatment, inexpensive framed prints, and one nice coordinating towel set can make a huge improvement to your dated bathroom. According to homeadvisor.com, the average bathroom remodel costs about $10,000. If your new home needs updates, choose what you’ll do first according to your budget. Tiding over with a few inexpensive updates to your bathroom will ease the anxiety of getting it done sooner, because it will be more pleasing to the eye. Save yourself some stress and money by holding out just a little longer, and when it’s time, you’ll have the perfect bathroom!